Are you looking forward to a summer PCS? If so, you’ve most likely started making lists. Jotting down tasks “to do.” Writing out things to remember. Noting those important details. With checklists already trending in your daily news feed, I’m offering a few tips to consider while you plan and prepare for military moving season. 1) Start your search online. After moving with the military, year after year, I have to be honest with you. By far, MilitaryByOwner has the most online resources for a military family facing a PCS. No matter if you choose to buy or rent a home, MilitaryByOwner offers helpful guidance every step of the way. Need the name of a real estate professional? There’s a handy business directory. Looking to support your children through this PCS? Read through blog posts written by military spouses and parents. Searching for stellar properties? MilitaryByOwner offers a wide range of listings to help you find your new nest. Spend some time on this easy to navigate website and you’ll end up feeling empowered to take on whatever this PCS dishes out. And after narrowing down your home search, be sure to check Military Town Advisor's neighborhood reviews to get honest feedback about an area from other military families. 2) Travel ahead of time if you can. If your budget allows, you’ll find it’s helpful to travel to the area you’ll be moving to. In our post Tips to Make Your Pre-PCS Househunting Trip a Success, you'll find expert advice for your househunting trip. If you can schedule a trip ahead of your move, you’ll face this PCS with less stress and more excitement! 3) Make use of personal connections. The military gets smaller the longer you're in, so chances are you know someone (or know someone who knows someone) already living in the area. With their trustworthy reviews, your mates can recommend the best place to stay or even take you on a local tour to check out the schools, parks, churches, and shopping districts. Observing your pal's slice of life could prepare you for the daily commute and give you a glimpse of the community. However, when you start to shop for homes, keep your mind open to a variety of different neighborhoods. Compare the recommended developments to other appealing areas. Who knows? You might find your “everything” in a community that is a hidden gem. Sometimes with a military assignment, you're in lone wolf status – as in, the first of your social pack to move to that location. If so, while in billeting or a hotel, chat with those at the front desk for the scoop on where local events are held. Finding out about traffic, parking, and noise can ease concerns over a rental tucked along the parade route of the annual Muskrat Festival. And don't forget to check in with your housing office for local listings and areas to avoid. 5) Map out your daily activities before making a decision. As you look for a place to call home, it’s okay if you end up getting lost! Straying from the main roads is a good way to observe the area and what it offers. Take note of the drive time to the places you’d most likely go. Where can your child continue karate? How far away is the nearest Target or Costco? Whatever conveniences you prefer, consider the ease of access from various neighborhoods. 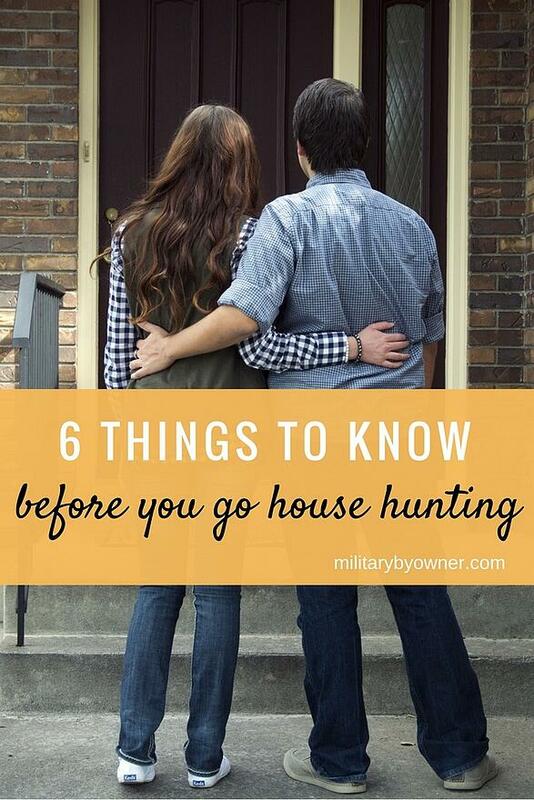 6) Visually document your house hunting. Use your phone's camera to take photos of potential properties. In order to remember details for further reference, jot down a few notes about each picture. For example, “Brick house with a large garage had a DeLorean parked in the driveway.” Picking out characteristics of each place will trigger your memory and help you narrow down your choices. When you find the home you’ve been hoping for, refer to your lists you’ve been making and MilitaryByOwner's homebuying resources. 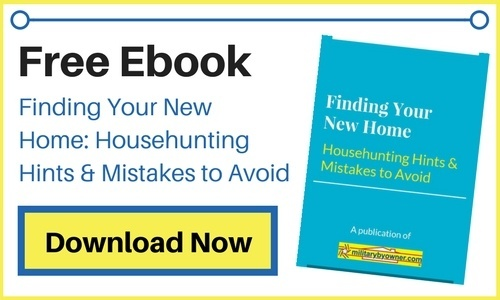 If buying a home or signing a lease, browse the complimentary ebooks filled with tips and hints to help make your upcoming transition as smooth as possible.